Rob Salamida, president and founder of The Rob Salamida Co., Inc., has been featured in many news articles throughout the years. Stories of Rob Salamida's growing business have appeared in Men's Journal, Edible, Saveur, and Gourmet Magazine. In 1908, over a bowl of seaweed soup, Japanese scientist Kikunae Ikeda asked a question that would change the food industry forever: what gave dashi, a ubiquitous Japanese soup base, its meaty flavor? In Japanese cuisine, dashi, a fermented base made from boiled seaweed and dried fish, was widely used by chefs to add extra oomph to meals�pairing well with other savory, but meatless foods like vegetables and soy. For some reason that was generally accepted but inexplicable, dashi made these meatless foods meaty�and Ikeda was determined to find out why. Ikeda was able to isolate the main substance of dashi�the seaweed Laminaria japonica. He then took the seaweed and ran it through a series of chemical experiments, using evaporation to isolate a specific compound within the seaweed. After days of evaporating and treating the seaweed, he saw the development of a crystalline form. When he tasted the crystals, he recognized the distinct savory taste that dashi lent to other foods, a taste that he deemed umami, from the Japanese umai (delicious.) It was a breakthrough that challenged a cornerstone of culinary thinking: instead of four tastes�sweet, salty, bitter and sour�there were now five. A new frontier of taste had been discovered, and Ikeda wasted no time monopolizing on his discovery. He determined the molecular formula of the crystals: C5H9NO4, the same as glutamic acid, an amino acid designated as non-essential because the human body, as well as a large smattering of other plants and animals is able to produce it on its own. In the body, glutamic acid is often found as glutamate, a different compound that has one less hydrogen atom. Glutamate is one of the most abundant excitatory neurotransmitters in brain, playing a crucial role in memory and learning. The FDA estimates that the average adult consumes 13 grams of it a day from the protein in food. Non-meat food sources like tomatoes and Parmesan cheese have high levels of glutamic acid. In 1909, Ikeda began mass-producing Ajinomoto (meaning �essence of taste�), an additive that came out of his creation of the first method of industrially producing glutamate by way of fermented vegetable proteins. 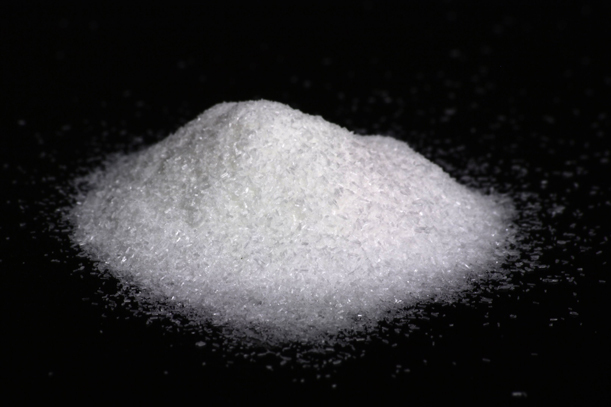 The resulting sodium salt form of glutamic acid (the acid with just a single sodium molecule) became famous for its ability to imbue a meaty flavor into dishes, or just naturally enhance the flavor of food. It was touted as a nutritional wonder, helping bland but nutritious food become delicious. A growing number of Japanese housewives used the product, and by the 1930s, recipes included Ajinomoto use in their directions. The sodium salt of glutamic acid remains prevalent today�anyone who has eaten KFC or Doritos has ingested it; it�s just known by a different name: monosodium glutamate, or MSG. 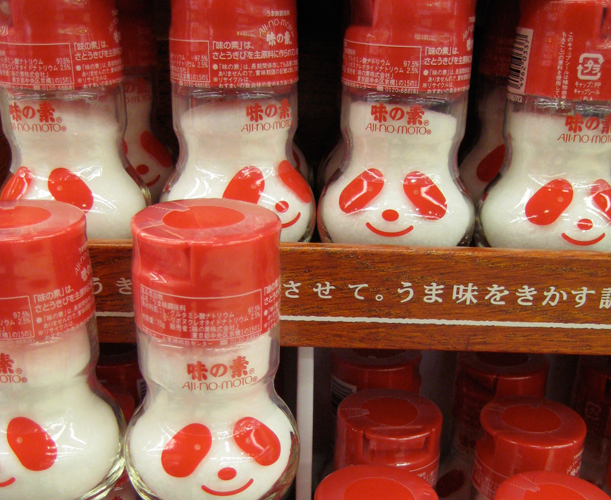 Panda-inspired bottles of Ajinomto�s glutamtic salt. Photo via Flickr user Kinya Hanada. Few letters have the power to stop conversation in its tracks more than MSG, one of the most infamous additives in the food industry. The three little letters carry so much negative weight that they�re often whispered sheepishly or, more often, decidedly preceded by the modifier �NO� that seems to make everyone breathe a collective sigh of relief when they go out to eat. Nobody wants MSG in their food�the protest goes�it causes headaches, stomachaches, dizziness and general malaise. It�s unhealthy and, maybe even worse, unsexy, used by lazy chefs as an excuse for flavor, not an enhancement. On the other side of the spectrum lies umami: few foodie buzzwords pop off the lips with such entertaining ease. Enterprising young chefs like David Chang (of Momofuku fame) and Adam Fleischman, of the LA-based chain Umami Burger, have built their culinary careers on the basis of the fifth taste, revitalizing an interest in the meaty-depth of umami. It�s difficult to watch the Food Network or Travel Channel or any food-based program without hearing mention of the taste wunderkind, a host or chef cooing over the deep umami flavors of a Portobello mushroom. Where MSG is scary, umami is exciting. What few people understand is that the hated MSG and the adored umami are chemically related: umami is tasted by the very receptors that MSG targets. At a MAD Symposium in Denmark, a TED-like conference for the food industry, Chang spoke about MSG and umami: �For me, the way that I�m looking at umami, it�s the same way I look at MSG. It�s one in the same.� But if chefs like Chang (neither inept nor lazy when it comes to flavor, as his Michelin stars would attest to) are down with MSG, why does the additive retain such a bad reputation? After gaining a foothold in Japanese cooking columns, MSG spread throughout Asia, becoming especially popular in Chinese cooking for enhancing both stocks and vegetarian dishes. Everyone knows this connection, and probably associates MSG use in America most heavily with Chinese restaurants�thanks in large part to the absurdly racist name for MSG sensitivity �Chinese Restaurant Syndrome.� But MSG�s foray into American cuisine came from more than Chinese dishes; MSG became popular in the United States during World War II thanks in large part to the country�s increasing military-industrial complex. The military thought that they had found in MSG an answer to the flavorless rations allotted to soldiers, and when the war ended, the troops came home and so did the industrialization of food production. From canned vegetables to frozen dinners, industrially created food was met with wonder in the United States. That all changed in the 1960s, when trust in industrial food began to wane. In 1962, Rachel Carson published Silent Spring, a manifesto against pesticides that kicked off the environmental movement. As pesticides quickly fell from grace, faith in the industry of yesteryear�of the chemicals and additives born from the war�declined as well. In 1968, MSG�s death knell rang in the form of a letter written to the New England Journal of Medicine by Robert Ho Man Kwok, a Chinese-American doctor from Maryland. Kwok claimed that after eating at Chinese restaurants, he often came down with certain unpleasant symptoms, namely �numbness at the back of the neck, gradually radiating to both arms and the back� and �general weakness and palpitation.� After Kwok�s letter ran, the journal received a deluge of letters from other readers, all claiming to suffer from the same affliction, deemed �Chinese Restaurant Syndrome� by editors. Some readers presented the same symptoms as Kwok, but most were extremely varied, ranging from cold sweats to extreme dizziness. In response, the Journal offered up MSG as the likely culprit for their reader�s unpleasant symptoms. Public interest spurred a number of scientific inquiries into the potential danger of MSG. According to food historian Ian Mosby�s exploration of MSG in �That Won-Ton Soup Headache� these inquiries went one of two ways: they either sought to prove the harmful short-term effects of MSG (and Chinese Restaurant Syndrome) or they looked to identify more long-term damage caused by the additive. Initially, researchers had success proving both the short-term and long-term dangers of MSG: mice injected with the additive showed signs of brain lesions, and humans fed 3 grams of MSG per 200 ml of soup presented symptoms congruent with �Chinese Restaurant Syndrome.� Subsequent studies, however, provided mixed results: some confirmed findings of brain lesions in animals or symptoms in humans, but other studies were unable to replicate the results. Double-blind studies often showed little correlation between MSG and adverse symptoms. Parties on both sides of the debate slung accusations at the other, with the anti-MSG researchers claiming that studies were being funded by MSG producers, and pro-MSG researchers accusing the other side of fear-mongering. FDA considers the addition of MSG to foods to be �generally recognized as safe� (GRAS). Although many people identify themselves as sensitive to MSG, in studies with such individuals given MSG or a placebo, scientists have not been able to consistently trigger reactions. Scientific interest in its deleterious effects seems to be waning: one of the last studies to gain public attention was published in 2011. The authors of that study claimed to have found a link between MSG and obesity, though those results have been questioned. While the general scientific consensus seems to be that only in large doses and on an empty stomach can MSG temporarily affect a small subset of the population, MSG�s reputation is still maligned in the public eye. On the other hand, MSG�s glutamic cousin umami suffers no public scorn: in 2010, umami was deemed one of the most delicious food trends to watch. When Adam Fleischman�s Umami Burger (a burger chain devoted to all things umami) opened a New York outpost, the wait for a meaty bite stretched on for three-hours. In addition to piling natural glutamates onto their burger to ensure the most umami flavor, Umami Burger enhances the burger with their �umami dust,� a blend of dried mushrooms and seaweed, and umami sauce, which includes soy and Marmite. Altogether, an original Umami Burger contains 2,185 mg of glutamate. A highly glutamic burger from Umami Burger. Photo via Wikipedia. 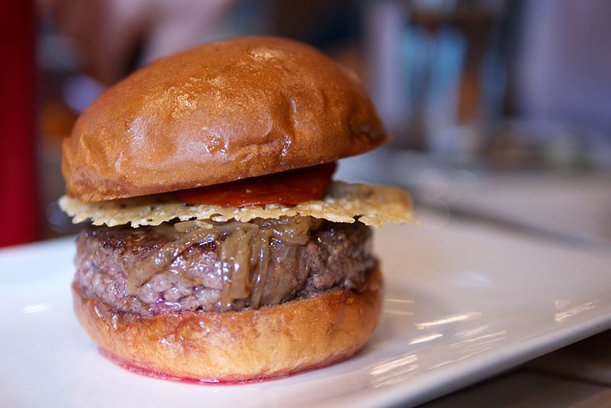 By harnessing natural glutamates for their burgers, Umami Burger avoids negative connotations associated with MSG. But the �natural� glutamates in an Umami Burger aren�t chemically any different from glutamtes in MSG. Glutamtes that occur naturally in food come intertwined with different chemicals or fiber, which the body is naturally inclined to regulate, explains Amy Cheng Vollmer, professor of biology at Swarthmore College. MSG, however, comes without the natural components of food that help the body regulate glutamic levels. It�s like taking an iron supplement versus obtaining iron from spinach or red meat: the iron supplement creates an expressway between the iron and your bloodstream that you wouldn�t find in natural iron sources. �The bottom line here is context is everything,� Vollmer adds. So does MSG deserve its bad rap? For the small section of the population that shows sensitivity to it, probably. But for the rest of America, maybe it�s time to reconsider exactly what we�re so afraid of when it comes to MSG.